In his letter to Crane & Co. of Nov. 11, 1881, Mr. Bradley seemed a bit put out that a company such as Crane would be ordering gummed labels of various sizes and colors for its samples. Actually, this letter was likely not written by Milton Bradley himself; more about that in a bit. Bradley was born in Vienna, Maine, in 1836 and moved to Springfield, Massachusetts, at the age of 19. Trained as a draftsman, Bradley got a job with the Wason Car Manufacturing Co., drawing the plans for the company’s line of locomotives and railroad cars. It was after Bradley was given a color lithograph of a particularly lavish car which he had helped to design for the ruler of Egypt, that he decided to go into the lithography business himself. In 1860, at the age of 24, he formed the Milton Bradley Company to produce lithographs for Springfield businesses. With the only color lithograph machine in Massachusetts outside Boston, Bradley was soon busy with orders, but making a profit was difficult. The website Funding Universe tells us that one evening while visiting his best friend, George Tapley, Bradley played an old English board game and conceived the idea of inventing a distinctly American game. Calling his game “The Checkered Game of Life,” he borrowed the format of the familiar checkerboard and incorporated into it a narrative of life as seen through the eyes of the New England puritan tradition. 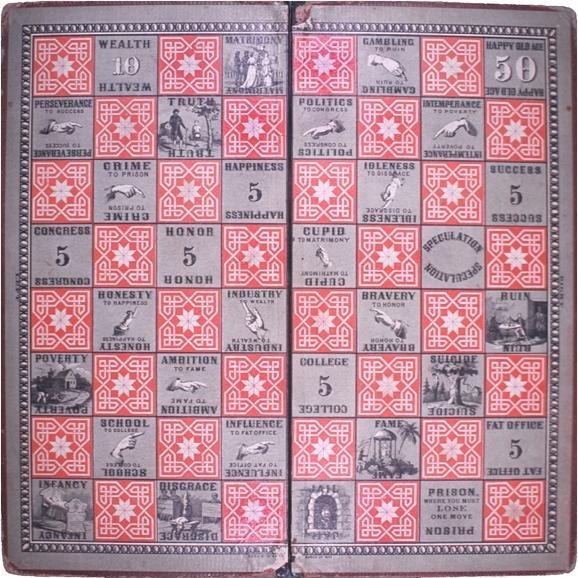 The object of the game was to achieve “Happy Old Age” instead of “Ruin.” Bradley spent weeks producing several hundred copies of the game and then set off for New York City to try selling this first production run to distributors. To Bradley’s surprise, dealers were unreservedly enthusiastic about the new game, which could be sold as a lesson in morals as well as an entertaining pastime, and within a few days Bradley had sold his entire stock. By the winter of 1860, Bradley had sold 40,000 copies of the game, and it was becoming a nationwide fad. Bradley became convinced that future success would come through producing games. Bradley and his company would have an interesting and varied history from this point forward. Bradley attended a lecture in 1869 about the German movement toward kindergarten and became enthralled with the concept of pre-school education. Bradley’s company’s involvement with kindergartens began with the production of “gifts,” geometric wooden playthings that he felt were necessary to properly structure children’s creative development. As he became more and more committed to the movement, Bradley began manufacturing other educational materials considered essential by Froebel including colored papers and paints. Bradley spent months devising the exact shades in which to produce these materials; his final choice of six pigments of red, orange, yellow, green, blue, and violet would remain the standard colors for children’s art supplies through the 20th century. The Milton Bradley company was acquired by toy giant Hasbro in 1984. Hasbro remains proud of its roots in association with Milton Bradley, and beginning Nov. 25, 2011, will open a new permanent exhibit at the Lyman and Merrie Wood Museum of Springfield History. Made possible by a grant from the Hasbro Children’s Fund, the new Hasbro GameLand pays tribute to Milton Bradley with games of memory, chance, speed, imagination, strategy and word play.